Cecily’s governess, Miss Prism adds further merriment… Jodie Lynne McClintock’s Miss Prism is delightfully blustery and prim. A secret 1:1!!! There, behind the maze of trees, was a large, jovial looking woman with a big white bonnet. She spoke to me in French. I could not understand a word. Then she began to tell me the story of love and loss (in heavily accented English). After that highlight, the rest of the evening was a blur. 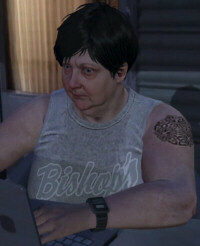 Grand Theft Auto V represents a return for the series to the broad comedy of violence…“Movies are about telling the same lies over and over again”… Video games tell their own lies to their players… And Grand Theft Auto V is one of the most beautiful, seductive lies yet uttered by our youngest creative medium. In that marvelous movie, "Shakespeare in Love," the young Bard wonders if he should rename his new play, "Romeo and Ethel, the Pirate's Daughter." Of course he doesn't, opting for "Romeo and Juliet." However, had the young playwright seen his work now at the Shakespeare Theatre of New Jersey, he might well have retitled it "Romeo, Juliet, and Her Nurse." For while the two lovers make firm impressions, Jodie Lynne McClintock reminds Madison audiences what a terrific role the Nurse is. McClintock reinforces that the Nurse fervently loves Juliet as if the girl were her own daughter. When Juliet is in agony, McClintock empathizes to the depth of her soul. When Juliet rejoices, McClintock acts as if a winning lottery ticket is hers. Shakespeare gave the Nurse all the low comedy in this play, and McClintock understands all of it. When she must explain a situation, she amusingly goes round and round the subject before landing on the point she could have made in a third as many sentences. McClintock is wonderfully clueless, no matter how many stern faces she makes, prattling away, unapologetically doing it her way. The Princeton Packet "Romeo and Juliet" - Shakespeare Theatre of New Jersey stages a legendary romance. And, in a performance to savor, Jodie Lynne McClintock as Juliet’s nurse-since-birth makes her debut with the company a stirring one. Kennedy's direction distinguishes the production by giving it a uniquely timeless quality. So, too, does Jodie Lynne McClintock, who nearly steals the show as Juliet's loving nurse, celebrating every triumph and suffering every tragedy with broadly eccentric and enormously appealing verve. Short and stout, she never gets in the way of the story, but is about as hard to miss as a bowling ball in a game of marbles. This is a robust, intense, beautifully acted version of the story…Shakespeare often treated servants as comic relief, but in this production, Juliet’s Nurse (Jodie Lynne McClintock), though inarguably funny, has a stronger sense of self than many of the nobles. At one point, exhausted, she stretches out on her young mistress’s brocade chaise longue, and Juliet fans her. "The most difficult role is that of wife and mother Peg- well handled by Jodie Lynne McClintock. She rises above with a performance that brings tears to your eyes in the closing moments. It’s a very special play… poignant, honest, and beautifully done." "Jodie Lynne McClintock is wonderful." "Jodie Lynne McClintock does very well as Cathleen, providing an appropriately respectful sounding board for Mary in Act Three, while also conveying an uneasy suspicion about Mary's behavior. Her drunkenness is believable and humorous, enjoyed with a lightness that is in obvious contrast with the increasingly somber intoxication of the Tyrones." The film is never more powerful, though, than in a montage of passengers crying farewells into cell phones, when suddenly there's Pittsburgh native Jodie Lynne McClintock, playing passenger Marion R. Britton, saying "I love you, too, Fred. Call your people." And that brings home the horror more than anything. In God's absence, we have only other human beings to love us. Hence in the phone calls made from the plane, heartrendingly documented by Greengrass. The message or mantra is always the same and is uttered usually with calm deliberation. "I love you" is for these people a last will and testament. One woman (Jodie Lynne McClintock), after completing her terminal call, hands the airphone to her younger neighbour in the next seat, who presumably lacks a credit card, and says: "Here, call your people." It is a small and beautiful act of generosity. Heroes come in many forms; some speak loudly, some just whisper. There was another kind of heroism on that plane, one that perhaps didn't make so many headlines. A woman (Jodie Lynne McClintock), tearfully speaking to a loved one for the last time, cuts her own phone call short so as to press her phone into the hands of the stranger next to her. "Call your people," she says quietly... From these people, something extraordinary came. United 93 is disturbing viewing but full of inspiring, unforgettable moments, especially among the passengers as their fate dawns. 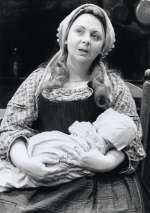 A lady (Jodie Lynne McClintock) gives her mobile to a young woman next to her. "You call your people," she says simply. It is a masterpiece -- heartbreaking but life-affirming. Acting honors for the evening, however, go to Jodie Lynne McClintock as the servant Nelly Dean. 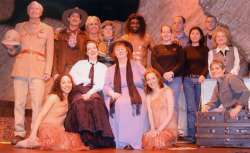 Pressed into service by both families and asked by adaptor Johanson to keep explaining what is going on, she almost never leaves the stage and is rewarded at the final curtain by the loudest applause. 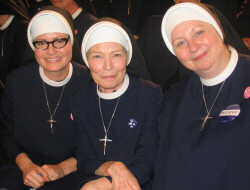 With involving cute nuns and their lovable quirks (Jodie Lynne McClintock as Sister Thomas), performances across the board are earnest and engaging. 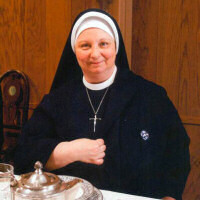 As that old chestnut, the 'cute' nuns, one who is supposedly the height of cheeky adorableness for wearing black Chucky Taylors or riding a stationary bike, Phyllis Somerville (Showtime's 'The Big C') and Jodie Lynne McClintock provide the comic relief. The acting and story are so good it brought tears to my eyes as these women fight the odds... the performances of the entire cast shine. A ragtag women's basketball team—cheered on by nuns in high-top sneakers— sets its sights on a national championship. Can we get a GO TEAM! The Mighty Macs comes off as well-made, well-acted and altogether cheerable. Sometimes a film is impossible to resist…you have to love seeing nuns shouting basketball strategy from courtside. Rarely do you see lives so persuasively scraped raw onstage... a patient, confident production, well acted by an ensemble that has obviously worked hard and to good effect on the distinct (and difficult) Nottinghamshire accent, and that is especially good at keeping the characters in period in spite of the temptation to render Lawrence's forward-looking realism in a more contemporary performance idiom. Ms. McClintock does a thoughtful and engaging turn as Mrs. Purdy, wisely understating the eccentricity and selfishness of a character who could easily have become overly comic, without dispensing with idiosyncrasy. It comes as a pleasant change of pace when Mrs. Purdy, a neighbor, shows up to interrupt things. After some initial worrying about Joe's arm and more talk about the mines (Mrs. Purdy's husband has been demoted in what would be, today, an age discrimination lawsuit), she gets to the point. Her daughter is pregnant by Mrs. Gascoynes' older, recently married, son Luther. 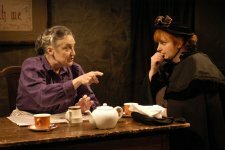 Mrs. Purdy, in an effort to keep things quiet and save her daughter's reputation, has come to request what seems to have been the going-rate for "hush money" in the early twentieth century. One can tell that the company has thoroughly investigated the text and sought to find the inner truths for these characters. When, for instance, Jodie Lynne McClintock, as Mrs. Purdy enters, one sees that there is something on her mind from the weak smiles that she gives to Joe. The ensemble of five actors all do excellent work, a volatile bunch - count on something to occur . 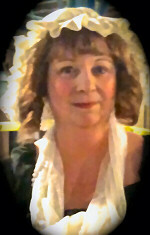 . . Jodie Lynne McClintock is memorable as Mrs. Purdy, the pragmatic mother of Luther's pre-nuptial paramour. To round out the overall excellence of the performances there's Jodie Lynne McClintock as the mother of a less uppity girl . . .
Jodie Lynne McClintock equals the others in locating the Nottinghamshire grit and humility within herself. Part of the joy in watching Shadowland Theatre’s latest production, “Red Herring,” lies in seeing the almost magical transformation of five of the actors who play multiple parts….praise goes to the wonderful Jodie Lynne McClintock as: Mrs. Kravitz/Mrs. McCarthy/Mrs. Van Nostrand. 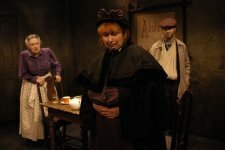 Easily slipping into different accents and personas, McClintock delights as she bustles about the stage, frantically trying to keep the pieces of this farcical chess match moving in the right directions… In one scene, Mrs. Kravitz (McClintock) is trying to hide Andrei’s Russian identity and tells Frank that Andrei is mute. What follows is fall-off-your-chair funny, as Andrei invents his own sign language and Mrs. Kravitz translates. It’s like watching a 1950’s Japanese monster movie… it is truly a joy to watch. A powerful performance is delivered by Jodie Lynne McClintock . . . McClintock is fanatical as Annie Lock, but it is difficult to dislike her. Though she represents the destruction of the aboriginal culture, the strength in her faith lends her mission legitimacy. Her scene with Daisy are lessons in "less is more". She does not pontificate, she simply says what she believes and it is striking. Perhaps the most interesting character is Jodie Lynne McClintock's Annie Lock, the missionary who becomes Daisy's ideological combatant. 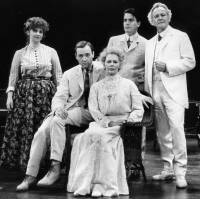 Truly yin and yang, the two are at odds for a great deal of the play, until late in the second act, when a striking scene demands the audience questions its own perceptions of the characters, shining light on the similarities between Annie and Daisy that go deeper than had previously been suggested. Of exceptional talent is Jodie Lynne McClintock in the role of Anna Livia. Her final 45-minute monologue is magnificent. The second act belongs almost entirely to Jodie Lynne McClintock soliloquizing as Anna Livia Plurabelle, the later counterpart of "Ulysses"' Molly Bloom. Here is the Irish girlchild grown to sensuous womanhood, savoring life's pleasures and more than a few of its disappointments. Ms. McClintock is a remarkable actress of the Sada Thompson type: hefty and not beautiful, she is a wonderfully engaging and authentic Irish earth mother. Her moods are kaleidoscopic, kinetic, incessant. Her brogue always seems right, indicative that her station in life is not all that she would wish. And yet her love for her husband, Humphrey Chipen Earwicker... is not only sincere but constant. Helping to bring Tony's words to life is an amazing cast. Another central character was "Lorraine," played by Jodie Lynne McClintock ("United 93," "30 Rock"). With a beautiful singing voice and even greater acting skills, Jodie added much heart and humor to this show. 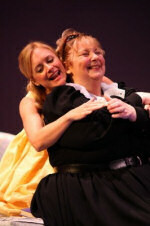 Laughs are also present in many of the scenes involving Betty and her best friend, Lorraine (an understated and amiable Jodie Lynne McClintock), an Avon-selling housewife, whose presence in the play -- and carefully concealed home life -- becomes crucial to several reversals late in this contemporary Southern Gothic tale. 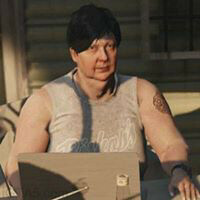 Rising above it all is Jodie Lynne McClintock, as Betty's close friend, church soloist Lorraine, giving an understated performance of realistic humor and dignity. Jodie Lynne McClintock has interesting moments as Betty's plus-size pal who carries a tune and pepper spray... played with great panache by Jodie Lynne McClintock. Terence Lamude’s smartly observed fine new play is set in the shoreline Southampton, Long Island home of the Moloney sisters; Joan (Jodie Lynne McClintock in a keenly observed performance), is an overweight former second grade teacher who is drifting through her life. Retired schoolteacher Joan (Jodie Lynne McClintock) generally goes with the flow, but she, too, is fond of the house and the community… The opening of Act II, a lovely duet between Joan and Cathleen that gives us a glimpse into each woman and their relationship, is, to my way of thinking, the best part of the play. 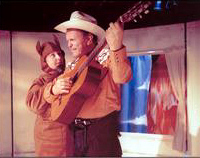 "My mother always warned me about cowboys," giggles Marie (Jodie Lynne McClintock), who in the play's fantasy becomes Rex's lascivious horse. The cowboy and his amore banter suggestively on the way to the barn. As in dreams, the events make no sense, but the emotions behind them do - loss and fear and longing. A remarkable ensemble (Hope Clarke, Jodie Lynne McClintock, Sheriden Thomas, John Freimann, Michael Shelle, Judith Van Buren) makes this heartbreak -- and much else -- visceral.